The first full weekend of 2017 heralded the start of the show season. 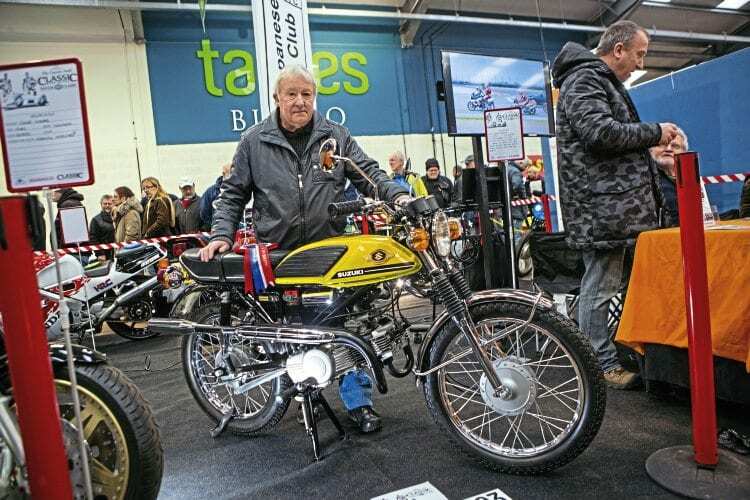 The Carole Nash Classic Bike Guide Winter Classic at Newark was, in many ways, a tale of twins – Alan Baldwin’s 125cc Suzuki Stinger, a frantic two-stroke twin, dating to 1972, which was chosen as Best in Show; the Covel twin, displayed on the Velocette Owners’ Club stand by restorer Bill Dawson, while over on the Gold Star Owners’ Club, the spectacular V-twin Shackleford Special was causing visitors to stop and scratch their heads, too. Best in show winner Alan Baldwin, with his glistening Suzuki Stinger. Alan is the dad of Andy Baldwin, who, with partner Heidi Cockerton, is no stranger to show success, with their catalogue-perfect Suzukis meaning the family’s already groaning mantelpiece was due to be put under more pressure, as the bright yellow Stinger took the main award. The Stinger is a rare and interesting little machine – a parallel flat-twin of 124cc, possessed of twin carbs, one wonders whether the designers looked at Moto Rumi when seeking inspiration? There’s certainly, to my mind at least, some synergy between the Stinger and the Moto Rumi Junior Gentleman. Alan’s Stinger looked absolutely spot on, even managing to stand out among the other fabulous machinery on the VJMC stand.